One of the advantages of collecting Vintage Citizen Watches is the fact that most of them can be easily dated. This is important for any collector. It is always nice to find a watch that was made the very same year you were born. And guess what, for Citizen you can go even further! You can date it by month also! 1. First of all, we turn the watch over and look at the caseback. Most of the time over there we have a lot of information regarding the case model, the watch model, the material and, very important in dating one, the serial number. This serial number is usually 8 digits. Those 8 digits show the year and the month. The first digit is an indication of the year. The next two are for the month. In the example below the first digit is 6 so it can be only a year ending in 6 such as 1956, 1966, 1976 or 1986. 3. After we identified the serial and the possible year we go deeper. We look at the model and at the movement. Certain models and movements indicate a specific time frame so it is easy to identify the exact year. We know this model was not made so late as 1986 so it is made in 1976. 4. The next two digits are 07 so the month is the seventh one – July. 5. 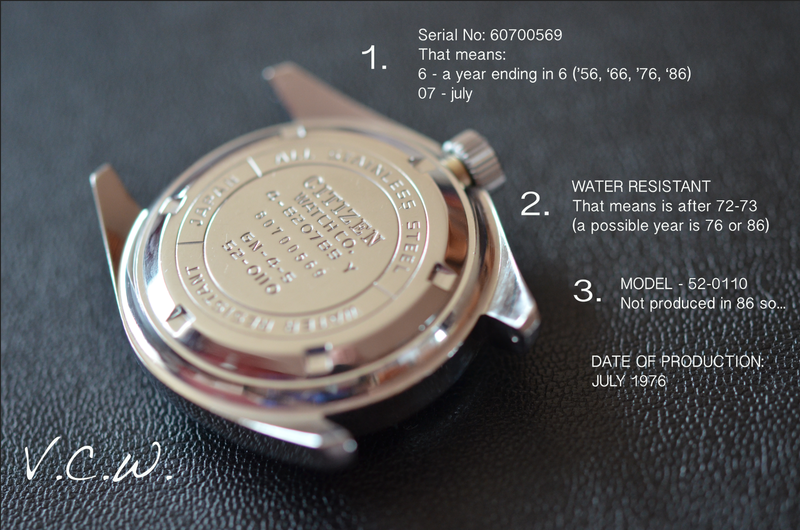 By putting all the information together a Vintage Citizen Watch can be, this way, dated. The watch here is made in 1976, July.